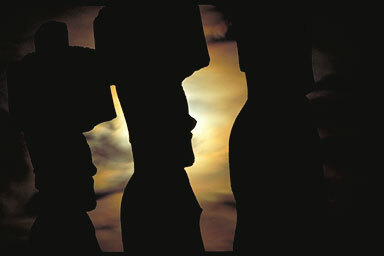 In the Fall of 2002, Hokule'a will travel to the remote Northwest Hawaiian Islands. Here, in a nearly pristine environment, are found 80% of our nation's coral reefs and over 7,000 marine species - half of which exist nowhere else. In 2000, President Clinton protected this sprawling ecosystem by designating it a natural reserve. Today, in a changing political climate, this protected status is in doubt. Hokule'a's mission is to restore an ancient wisdom, the Hawaiian concept of Malama - of caring for our land and sea to insure a balance among all forms of life. Hokule'a is a natural vehicle for carrying this message. For the last 27 years, she has sailed more than 90,000 miles, always guided by navigators who steered without instruments or charts - sailing instead as their ancestors did - by using a world of natural signs revealed in the wind, waves and stars. Voyaging under an immense sky dome in an empty sea has inspired humility among Hokule'a's crewmembers - an understanding of their place in the natural world. "When you voyage, you see the canoe as a tiny island surrounded by the sea," says captain and navigator Nainoa Thompson. "We have everything aboard that we need to survive as long as we marshal those resources well. Now we must look at our islands, and eventually the planet, in the same way. We must learn to be good stewards." Ancient Polynesians fashioned canoes like Hokule'a with stone tools. They used koa wood for the hulls, breadfruit sap and coconut husks for caulking, and coconut fiber rope for lashings. With materials from the land they fashioned a vessel to blend with the sea. "When our ancestors went to the mountains to cut down trees they did not think they were taking the tree's life," explains navigator Bruce Blankenfeld. "They were just altering its essence, taking it from the forest and putting it into the sea, and in Hawaii the sea and the land are tied together. Everything in the sea has a counterpart on the land because on an island the land and the sea rely on each other for life." In our rituals today we often recognize a particular kind of reef fish - life from the ocean - as equivalent to a particular taro plant - life from the land. Polynesians have always understood the inherent "oneness" of our natural world because islands are fragile places where the interaction of man and nature is clearly seen. Continental people are so distanced from this basic understanding of connectedness that they use a relatively new word to express it - ecology. Some Hawaiians see the string of reefs, atolls and islands to the northwest of Kauai as the kupuna - the ancestors - of our home islands. Uninhabited today, these were once the abode of both humans and spirits. Necker Island, for example, is known as Moku Mana Mana. Mana - the Hawaiian word for spiritual power - hints at the island's special meaning among ancient Polynesians, as do the 33 shrines that dot the island. These remote islands are also breeding grounds for over 80% of all rare Hawaiian green sea turtles - once an important food source. And they compose the Ring of Fire that extends from the nascent up-thrusting Lo`ihi, southeast of the Big Island of Hawaii - to Kure and Midway atolls, sinking slowly in the Northwest. Taken together, they tell a 25 million year tale of geologic birth and death, the expression on our planet's face of slowly moving tectonic plates. Once again science has proven ancient belief correct. The Northwest Hawaiian Islands are literally the kupuna - the ancestors - of the main Hawaiian group. Hokule'a's voyage serves as a thread to tie together these far flung islands and atolls of the Northwest Hawaiian group to tell many stories of ongoing research and conservation - all linked by our increasing concern for conserving life on our planet. In the late 1800's, for example, Laysan Island was mined for eggs, birds and guano - leading to great destruction and the death of 95% of one species of seabird. Today, this remote island and its bird population are being returned to nature by the work of dedicated conservationists. On land, monk seal teams set up camp at several islands to monitor the endangered populations. Seabird counts measure the success of nesting seasons. Research on spinner dolphins has just begun at Midway. Efforts to curb the invasive weeds and insects on several of the islands are accelerating. And potential translocation of the rare Laysan Duck, endemic to small, flat Laysan Island, is in discussion. Undersea, scientists continue to explore the deep waters surrounding the islands to discover new sea life and better understand the life cycles of bottom fish. With corals in decline worldwide, marine scientists are anxious to understand these reefs before they too become victim to global warming and other environmental threats. Hokule'a's first mission was to prove that Polynesia was settled by intrepid seafarers who learned to blend with their ocean world in order to survive. 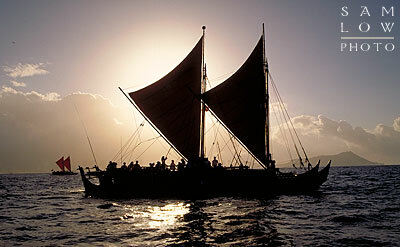 Today, Hokule'a sails to the theme of "navigating change" on a crowded and increasingly violent planet. "Our human societies are navigating off course," Nainoa Thompson explains. "Learning to survive on fragile islands is a microcosm for learning to survive everywhere. Every one of us - no matter what our ethnic background or nationality - is native to this planet. As the native community of Earth we should all aspire to live in pono - in balance - between all people, all living things and the resources of the Earth - our island home in an immense sea of space."